Welcome to another lovely edition of Muffin Tin Monday, the blog link up that has kids smiling everywhere and where we share the Muffin Tin Meals we make for our kids (and shhh, sometimes ourselves) each and every Monday. This summer, we are taking a break from the themes, so if you have been holding out and not participating, now is the perfect time! I did kind of a half theme this week. Stars in honor of Muffin Tin Monday. A few of us have been chatting via the new MTM facebook page about what we are going to do this week. And, everyone was talking about Memorial Day, so it was on the brain when I put together today's tin! In this star-shaped tin: carrots and ranch dip, potato bread stars, tangerine pieces, red grapes. This was a snack after a long day. Muffin Tin Girl loved it! And shhhhh.....I used a playdough cutter for the star bread pieces! What did you make? Won't you share it with us? Just click on the blue "inlinkz" button to add the URL of your photo or blog post. Very cute! 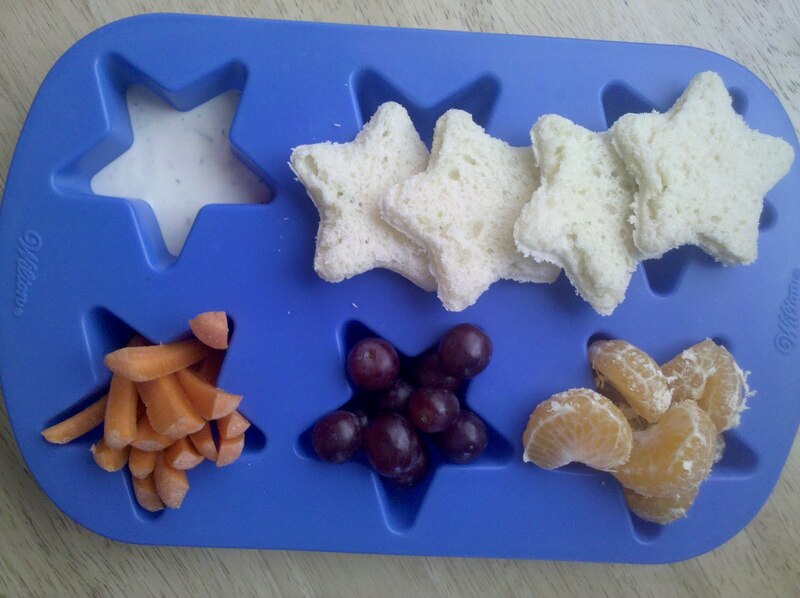 Love the stars, and I'd use a playdough cutter too if I needed it! I went with the star theme too. I hope you had a wonderful weekend. you're a star. heh heh. wait. so we're not supposed to use playdoh cutters on food? I love the stars and what a great snack! I didn't think about using playdough cutters to do it! We were a littel late this week. No Internet.. LOL Love all the tins that I saw.